Wie funktioniert das eigentlich mit dem Scam? Nachdem mein letzer investigativer Artikel so super funktioniert hat, hab ich mir letztens gedacht, ich schreib nochmal sowas. Diesmal aber bisserl ernster. Eigentlich war ich selbst neugierig und wollte das rausfinden und verbinde es jetzt einfach mit einem Blogartikel um vielleicht euch auch eine Antwort zu liefern. Viele von euch haben schon Geschichten gehört, dass Menschen 1000e Euro wohin auch immer überwiesen haben, in der Annahme, dass sie ein Vermögen dafür bekommen. Meistens beginnt es mit einem Mail, das auch schon viele von euch bekommen haben. Irgendjemand schreibt, dass er bei einer Bank arbeitet und ein Konto mit einem Millionenbetrag eine Verstorbenen zur Verfügung hat und jetzt dich braucht um das Geld ausser Landes zu schaffen. Als erstes ist mir gleich mal aufgefallen, dass derjenige davon ausgeht, dass mein Nachname „Hadeber“ ist, was ich mir gleich zu nutze gemacht habe um eine neue Identität zu erschaffen: Thomas Hadeber. E-Mail angelegt und dem guten Herren ein Mail geschrieben. Dazu gleich mehr. Die zweite Sache, die recht schlau gemacht ist: Wenn man den Namen des Herren googelt, dann stellt sich heraus, dass er wirklich CEO einer Bank in den Vereinigten Arabischen Emiraten ist und das Foto auch ihn zeigt. Man denkt sich also vielleicht „hmm… könnte schon stimmen“. Thanks for your Message about the Bank Account of D. Hadeber. It would be great to help you, transfering the money. Please tell me, what to do! Thanks for your interest in my proposal. My initial proposal to you was to brief you on the need to assist me so that we take advantage of the death of my former customer in the bank . One late D. Hadeber a citizen of your country had a fixed deposit with my bank in 2006 for 36 calendar months, valued at (Eighteen Million, Four Hundred Thousand US Dollars) the due date for this deposit contract was 16th of January 2009.Unfortunately, while on a business trip ,he died in a deadly earthquake that occurred on May 12, 2008 in Sichuan province of China and killed at least 68,000 people. Since the last quarter of 2009 until today,the management of Abu Dhabi Bank have been finding a means to reach him so as to ascertain if he will want to roll over the Deposit or have the contract sum withdrawn . Our bank management is yet to know about his death so I have drawn a blue print to preserve this fund and use the proceed for charity .As the Accounts manager to him , I have to take advantage of the situation to get the deposit he has with our bank instead of the bank heads to confiscate it for their selfish use. They are already rich because they get this type of business often and on .The late D. Hadeber does not have a next of kin in his file. He was also not married and there is no trace of any relative . The only way to get the fund is to find someone who has the same surname and then put it into the file of D. at the bank .It was while I was searching for one that I came across you. I do not have any alternative than to trust you with this money with the faith that you will be made to receive the money in your account after the processing assisted by an attorney I will give you – and then you will keep my fair share for me . 60/40 percent.However, I am freely giving you full details of this transaction now bearing in mind that you will not betray me. The name of the bank I work is Abu Dhabi Bank and presently I am a manager. This is what I need to commence this transfer, I need to place your detail in the computer system of the bank. Once i receive the above details i will commence the process. Das erste Mal lese ich also um wieviel Geld es also geht: 18.400.000$. Der Herr Hadeber ist also bei dem Erdbeben 2008 in China ums Leben gekommen, also wieder ein Fakt der durchaus nachprüfbar ist. Also zumindest, dass es das Erdbeben gab: WIKIPEDIA. Der gute Mann will mich also als seinen Verwandten in die Akten eintragen und somit erreichen, dass ich das Geld bekomme. Wenn ich es habe, teilen wir 60/40. So weit so gut. Um den Deal abzuschließen, braucht er noch meine Daten die er ins Banksystem einträgt: Name, Telefonnummer, Geburtstag und Adresse. Soweit so gut, ich spiele mit und er bekommt, erfundene Daten (bis auf die Telefonnummer, die lasse ich mal frei). Nice to read that. 60/40 is totaly OK for me! I still need your phone number to round up the details. Mein Plan hat auch soweit mal funktioniert und am nächsten Tag kam ein Mail, mit einem Brief, den ich an einen Anwalt schicken sollte, um meine Ansprüche geltend zu machen. Übrigens noch immer kein Wort darüber, dass ich Geld zahlen muss vorab oder ähnliches.. 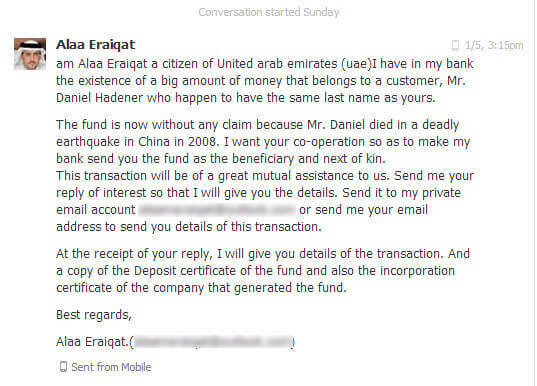 I am THOMAS HADEBER, I got your contact from a staff of the bank in the UAE and I learn you are registered with the Central bank of UAE. I wish to hire your services in a claim with the ABU DHABI BANK for my inherited fixed deposit account which belonged to my late cousin D. HADEBER. I want to terminate this contract DEPOSIT because it had expired and proceed to transfer the money back to my country since I have no more business in the UNITED ARAB EMIRATES (UAE) now. If you will handle this matter, let me know your requirements and the procedure as soon as possible. I wait your urgent reply. yours faithfully , THOMAS J HADEBER. send it today , and let me know his response. Das Mail habe ich natürlich an den Anwalt geschickt. Kurz darauf kam ein Mail von meinem Bankmann, in dem er nochmal versucht Vertrauen aufzubauen und erstmals Details von sich preisgibt. I however, want to inform you that this transaction requires utmost trust and dedication from your side, since you will be receiving the funds as the Next of Kin/ Heir to D. Hadeber and shall be in control of the money, until I come over for my share. Regarding the sharing, I am under the believe that my sharing ratio is accepted to you, 40/60% is a fair deal. I want you to bear one thing in mind, there is no risk involved in this transaction. It is 100% risk free and secured once you follow my instructions and keep everything secret between us. What I have to do is just to place your information in my bank system as the Next of Kin/Heir to the late D., and you will apply for the claim through a lawyer here in U. A. E. You do not have to come down here for the claim, the lawyer will represent you and handle all the documentation involved. Being a manager in my bank, the secret of the bank system is under my palm, placing your details in the system as the Next of Kin/ Heir to late D. is an easy work for me. ADDRESS: P.O. Box 939, Abu Dhab, UAE. Once I receive the above mentioned information and concludes with my inside arrangements and changes, I shall send you the contact details of a Lawyer you shall contact for the representation. The lawyer in question is good and specializes in such cases. He is also a registered attorney with the Central Bank of U. A. E, which is the bank that will handle the transfer of the funds out of the country to your bank account. As far as my bank is concern, I will be in control. It has been my dream to have my own company and I believe that Allah has answered my prayers by creating this opportunity. Please, remember to treat this transaction with utmost confidentiality for our own good. I await your urgent response. Spannend ist die „International Roaming Number“, scheinbar ein englisches Mobiltelefon. Wenn man die Nummer googelt, kommt allerdings nichts raus. Sie scheint nirgends aufzuscheinen. Auch aufgefallen ist mir, dass immer noch keine Rede davon ist, dass ich vorab Geld bezahlen soll oder ähnliches. Ganz im Gegenteil, es läuft darauf hinaus, dass er mir vertrauen muss, weil ja ich das Geld bekomme etc. must express my appreciation for choosing me to represent you in UAE. Account Type: FIXED DEPOSIT ACCOUNT. Date of Deposit: 16th AUGUST, 2006. Name of Bank: Abu Dhabi Bank. Mr.D. Hadeber. A total fund of US$18,400,000.00 , deposited. approvals from the bank and the requirements to get your claims to your favor .For my terms of service,you will be paying me 5% of the total fund 50 percent down payment .But the entire payment will be when you have received the fund . I am sure to receive the payment approval terms on Wednesday. I will keep checking with the bank. Der junge Mann will also 5% der Gesamtsumme (die mittlerweile 24.748.000$ beträgt, dank der Zinsen), sprich 1.237.400$ und 50% davon will er als Anzahlung. Öhm ja… knappe 600.000$ Anzahlung ist ja doch etwas viel.. Ich reagiere also erstmal nicht auf die Forderung, sondern bedanke mich nur für seine bisherige Arbeit. Ich höre erstmal fast 1 Woche nichts, und frage dann einfach mal frech nach, ob er denn von der Bank etwas gehört hat. Natürlich hat er das, und er braucht noch mehr Infos von mir. Ausserdem macht man erstmals Druck, in dem von einem 2 Wochen Fenster gesprochen wird. You are to provide. Photocopies of your international passport or driving lincense and your mobile phone number . So that the bank can complete the computer information if you don’t have a phone number or international passport you have 2weeks from todays date. Jetzt wirds etwas kompliziert, denn Pass und Führerschein könnte ich zwar Photoshopen, aber ich weiß nicht so genau ob das nicht schon eine Straftat in Österreich darstellt, auch wenn ich es nur dazu nutze um mehr über die Scamer zu erfahren. Deswegen muss erstmal eine Mobilnummer her, eine Wertkarte, denn die ist anonym. Gesagt getan, Nummer übermittelt und bezüglich der Dokumente um einen kleinen Aufschub gebeten. Am nächsten Tag hat das Telefon geläutet, die englische Nummer hat angerufen, also mein Bankkontakt. In nicht ganz akzentfreiem Englisch, der Akzent scheint afrikanisch zu sein, erklärt mir der Mann am Telefon, er habe mit dem Anwalt gerade gesprochen und erfahren, dass er eine Unsumme verlangt für seine Arbeit. Das gehe natürlich nicht und er hat ihm gesagt, er muss sich mit 100.000$ zufrieden geben und bekommt maximal eine Anzahlung von 20.000$. Weil er versteht, dass ich das nicht übernehmen kann, bietet er mir an, dass er 10.000$ übernimmt und ich die restlichen 10.000$. Ich bedanke mich bei ihm und sage ihm wie toll ich das alles finde und das ich versuchen werde, das Geld zu besorgen. Er soll mir ein paar Tage Zeit geben. 2 Tage später läutet das rote Telefon nochmal. Eine andere Nummer, wieder englische Vorwahl. Der Anwalt, Stimme ähnlich, aber nicht der selbe. Das englisch ist ein wenig schlechter. Er sagt mir, dass es ihm leid tut, dass er soviel Geld verlangt hat und das der Bankmensch gerade bei ihm sitzt und ihm das Geld gebracht hat, jetzt fehlen noch die 10.000$ von mir. Ich sage, dass ich das Geld noch nicht habe, ob ihm 5.000$ reichen würden. Er bespricht sich mit jemandem (er shceint den Hörer zu oder wegzuhalten, ich höre nur dumpfe Stimmen) und sagt, dass 5.000$ für den Anfang reichen würden, aber die Gebühren müsste ich dann noch übernehmen. Ich bekomme per Mail die Anweisung wo ich das Geld hinüberweisen soll und wie. Per Mail kam dann eine Erklärung wie ich per Western Union Geld überweise und an wen und damit ist die Sache für mich erledigt. Die Simkarte wird vernichtet, der Mailaccount gelöscht und ich bin um eine Erfahrung reicher. Das komische ist, die machen das wirklich so gut, dass ich mir durchaus vorstellen kann, dass Leute darauf reinfallen. Alles wirkt sehr rund, sehr durchdacht und zum Teil möglich (wenn man Ahnungslos ist). Noch dazu muss man sagen, dass die Verlockung nach Reichtum oft noch ein paar Sicherheitsmechanismen im Hirn ausschaltet. Ich kann mir also durchaus vorstellen, dass solche Scams oft genug funktionieren. Auf jeden Fall interessant zu wissen, wie solche Leute wirklich vorgehen. Danke für deinen Bericht.